For Office 2016, the hallmark guided-practice to skill-mastery pathway is better than ever. Students have many opportunities to work live in Microsoft office to apply the skills they've learned. In addition, instructional projects are now available as grader projects in MyITLab, so students can work live in Office while receiving auto-graded feedback. These high-fidelity simulations match the text and provide an effective pathway for learning, practicing, and assessing their abilities. After completing the instructional projects, students can apply their skills with a variety of progressively challenging projects that require them to solve problems, think critically, and create on their own. New GO! Collaborate with Google projects allow students to apply their skills to a new environment that is already popular in many workplaces. Integrated Microsoft Office Specialist (MOS) objectives make GO! 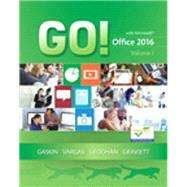 your one resource for learning Office, gaining critical productivity skills, and prepare for MOS certification. MyITLab ® is an online homework, tutorial, and assessment program designed for Information Technology (IT) courses, to engage students and improve results. HTML5 Simulation exercises and Live-in-Application Grader projects come with the convenience of auto-grading and instant feedback, so students learn more quickly and effectively, and build the critical skills needed for college and career success. Digital badges allow students to showcase their Microsoft Office or Computer Concepts competencies, keeping them motivated and focused on their future careers.